My Topeak Road Morph G Pump Review. I bought this bicycle pump because I was tired of being stranded using a small bicycle pump with a capacity not much larger than a sharpie marker. In the unfortunate event that I do encounter a flat, I want to be able to repair it and continue riding, rather than barely inflate the tube and be forced to turn around and ride home. That’s precisely the reason I chose Topeak’s Road Morph G bicycle pump. 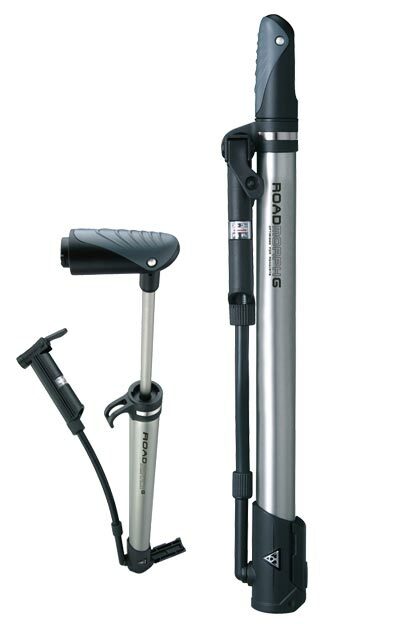 Overall, I feel this is The Best Portable Bicycle Pump one can buy! The Topeak Road Morph comes with an folding base lever, folding handle, extendable fill tube, large capacity air chamber. Three times the volume of my previous portable bike pump! The Road Morph has the capability to fill both shrader or presta valves. The Morph “G” signifies that it includes an accurate inline pressure gauge (reads up to 140 PSI). What’s even cooler is that this thing can fill all the way up to 160 PSI. That means, if you have a good tire and tube, this pump can fill it back up to fully functional riding pressure. I’ve had to use the Road Morph three times since purchase, and it has performed wonderfully for me. As long as I have a spare tube, tire and this pump… I am confident I’ll never be left stranded from tube/tire issues during a ride. It takes about one third as many pump cycles to fill a tire than any of my previous cage mounted portable bicycle pump. Additionally, those pump cycles are about twice as easy on my hand and arm. The pressure gauge works great as well, and I have tested it against my Topeak digital tire gauge to be fairly accurate. The extendable fill tube make it really easy to keep the pump filler attached to the valve. The only gripe I have, is that it is a big pump. 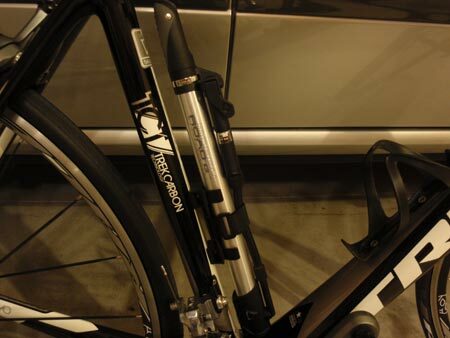 The Road Morph must be mounted in place of a water bottle cage on a carbon framed bicycle. It would be nice if Topeak were to allow the Road Morph to be mounted under a water bottle cage. Then we could still retain both water bottles. Hint hint – Topeak, if you are listening!